Win-Holt SSWMS154 Stainless Steel Fabricated Wall Mounted Shelf 15" x 48"
TigerChef > Storage > Restaurant Shelving > Wall Mount Shelving >< Wall Mounted Storage Shelves > Win-Holt SSWMS154 Stainless Steel Fabricated Wall Mounted Shelf 15" x 48"
$303.99 Win-Holt SSWMS152 Stainless Steel Fabricated Wall Mounted Shelf 15" x 24"
$247.99 Win-Holt SSWMS153 Stainless Steel Fabricated Wall Mounted Shelf 15" x 36"
$391.99 Win-Holt SSWMS155 Stainless Steel Fabricated Wall Mounted Shelf 15" x 60"
$444.99 Win-Holt SSWMS156 Stainless Steel Fabricated Wall Mounted Shelf 15" x 72"
$476.99 Win-Holt SSWMS157 Stainless Steel Fabricated Wall Mounted Shelf 15" x 84"
$550.99 Win-Holt SSWMS158 Stainless Steel Fabricated Wall Mounted Shelf 15" x 96"
$1,168.99 Win-Holt SSWMSH1510 Stainless Steel Fabricated Wall Mounted Shelf With Hooks 15" x 120"
$893.99 Win-Holt SSWMSH152 Stainless Steel Fabricated Wall Mounted Shelf With Hooks, 15" x 24"
$954.99 Win-Holt SSWMSH153 Stainless Steel Fabricated Wall Mounted Shelf With Hooks 15" x 36"
$1,005.99 Win-Holt SSWMSH155 Stainless Steel Fabricated Wall Mounted Shelf With Hooks 15" x 60"
$1,062.99 Win-Holt SSWMSH156 Stainless Steel Fabricated Wall Mounted Shelf With Hooks 15" x 72"
$1,070.99 Win-Holt SSWMSH157 Stainless Steel Fabricated Wall Mounted Shelf With Hooks 15" x 84"
$1,130.99 Win-Holt SSWMSH158 Stainless Steel Fabricated Wall Mounted Shelf With Hooks 15" x 96"
Designed to keep up with the rigors of high volume environments, the Win-Holt SSWMS154 Stainless Steel Fabricated Wall Mounted Shelf 15" x 48" features an all welded construction. This NSF certified shelf is easy to clean as well as maintain and is great for commercial use. 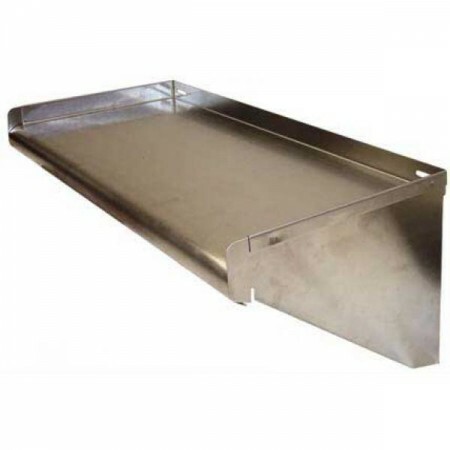 Constructed from all welded 16 gauge 304 series stainless steel, this shelf is rust proof and non-corrosive. For added convenience, this shelf is easy to set-up and can be mounted to any flat vertical surface.